Original Comment of 1926 from J. L. Grohmann: „Enclosed I send the picture of the 26-year-old mare with her this year’s colt by Baka 2:09 3/4." Lady Smith is a broodmare that has outclassed all other matrons in Austria. Her produce of 2:30 trotters numbers twelve, which is possibly also a record number for the whole of Europe in the breeding of trotters. As Lady Smith has a fine this year's colt by Baka 2:09 3/4, to whom she is again in foal, it may occur that the famous brood mare gets two more in the list within the next few years. 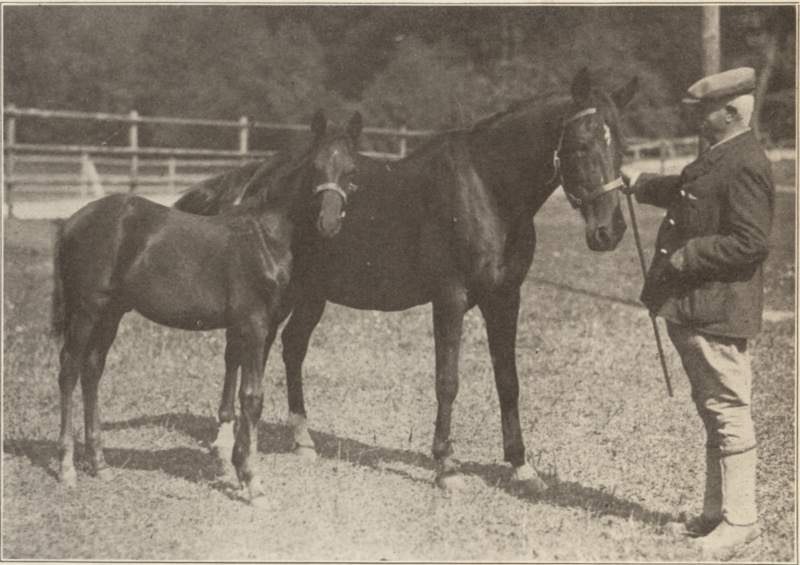 Lady Smith was foaled in 1900 at Mr. Rudolf Warren Lippits' stud farm at Thurnisch, Styria, which place at that time still belonged to "Austria-Hungary“, it is now situated within the borders of Yugoslavia. Lady Smith was sent to be trained when a twoyear-old and in 1903, driven by the late Burdett Tappan, took a record of 1:37 for the kilometer (2:36 per mile) shown over 2,600 meters (1-5/8-mile) at Pressbourg. At that time she was owned by Messrs. Morgenstern & Ruzicka. After having been sold to Prince Theodore Ypsilanti, she was soon taken to the prince's stud farm at Spillern, near Vienna, where she stayed until 1921, when she became the property of Mr. Oscar Trebitsch, who still owns her. Among the 12 2:30 trotters that the Lady has so far produced there is not an extra-fast one, but taking in consideration that she had not the opportunity of being bred to such sires as there are in America and that the records of her produce were established over one kilometer tracks and over distances of at least 2,000 meters, Lady Smith surely deserves the predicate "wonderful." 1907—Lord Fritz 2:38, by Freund Fritz. 1909—Love Game 2:251/2, by Freund Fritz. 1912—Lausbub 2:25, by The Zoo. 1913—Luros 2:243/4, by The Plunger. 1914—Lodz 2:171/2, by Marienhof, son of Wig Wag. 1915—Leon 2:171/2, by Allein, son of Freund Fritz. 1919—Liana 2:261/2, by Peter Bellini, son of Bellini. 1921—Kitty 2:283/4, by Baran McKinney. The sire of Lady Smith was Earl Baltic 2:17, who took his American record in 1895. The year 1896 he was imported to Austria by the late Canadian reinsman, Dan McPhee, for whom the Earl won some races, acquiring a European record of 2:21 over the Trieste half-mile track in 1897. Earl Baltic was bred by R. G. Stoner, of Paris Ky. He was a son of Baron Wilkes 2:18 and Alpha Russell, the latter being a daughter of Mambrino Russell 2008 and Alley, she by Hambletonian 10, out of Lady Griswold, by Flying Morgan. Lady Eleanor, the dam of Lady Smith, was brought over to Austria in 1895, when in foal to Antevolo, by H. A. Fleischmann, of New York. She was a daughter of Pilot Medium and Donna Davis, she by Frank Noble, out of Maggie Middleton, by Bay Middleton. Herself the dam of three 2:30 trotters, four of her daughters have produced 17 2:30 performers so far.